On a recent Friday I was on my feet all afternoon getting people checked in to install the new gate access device on their cars for our gated community. I was sore. 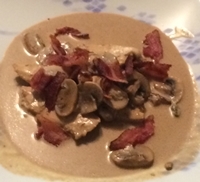 I had planed to make the creamy balsamic mushroom bacon chicken recipe from The Recipe Critic. I asked Terry to make it instead. She did. Terry is much more careful than I am, and she more closely follows recipes than do I. She did a marvelous job and it was excellent. Definitely one we can do again. 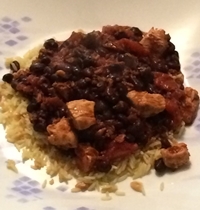 I have made this recipe from Cooking Light a few times. Whenever I make a chorizo recipe, however, I use soy chorizo, generally Trader Joe’s. As tasty as it is it is also really, really strong. When I made this recipe previously I made a note in my database to use only a quarter of the package instead of half, as I am wont to do. I made the recipe recently and did just that. I divided up the other three-quarters, froze them, and sealed them up with my trusty FoodSaver. As for the present dish using only a quarter of the package was just the key. Big and bold flavor, but not overwhelming. Our regional newspaper, the one I delivered when I was young, continues to make changes. Most recently they folded the local section into main section of the paper. The stated rationale was that local news was important enough to be in the main section. Nonsense. This was clearly a cost-saving move, though probably necessary for newspaper survival. Still, it’s not the paper that I once proudly delivered. Nonetheless, the changes are not all bad. As part of those changes they upgraded the features section and added two comics that I enjoy and which I hadn’t seen for a while. And on Saturdays they quietly added Miss Manners. I enjoy Miss Manners and her sharp wit. It’s nice to be able to read her smart and practical advice once again. Did you ever come to the realization that something was much simpler than you thought? I’ve done that more often than I care to admit. For decades I have struggled with garlic and found working with fresh garlic a pain. Peeling off the skin to get to the clove was frustrating and I often just used granulated garlic instead. 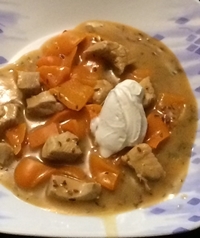 I tried the 20 seconds in the microwave thing, and while that worked, it left the garlic soft and mushy. Seems I wasn’t fully paying attention through all the thousands of hours I’ve watched Food Network shows. Take a knife and smash the clove with the side of it. The skin comes right off. No problem. Simple. Easy. And overlooked for years. Wow! I coulda had a V-8!